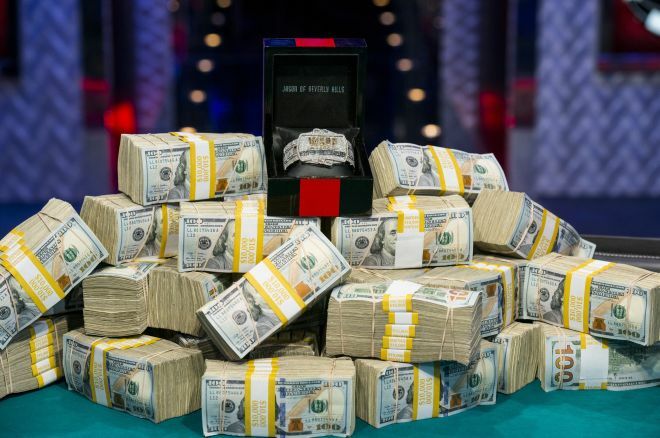 One of the great attractions of tournament poker is the way it offers players the chance to realize a much larger “ROI” (return on investment) than is typically the case when playing cash games. While doubling or tripling your buy-in in a cash game session can be regarded as a great outcome — and winning more an even rarer, exceedingly positive result — large field, multi-table tournaments such as at the 2015 World Series of Poker provide the chance to do much more than that. For example, the few who remain from the starting field of 7,192 who took part in Event #28: Monster Stack $1,500 No-Limit Hold’em are today continuing their battle for a huge $1,286,942 first prize — almost 858 times the buy-in (!). The player who experiences a relatively huge tourney score faces an interesting new problem, perhaps one the player hasn’t thought much about previously, namely, how best to handle such a sudden bankroll boost. Some choose to ignore the increase in funds with which to play, sticking to their usual buy-ins and/or limits. Others respond recklessly, going to the other extreme and taking wild shots at bigger games without necessarily being adequately prepared to make the move. Most, however, will adopt some sort of middle-ground approach. That’s exactly the strategy PokerNews’ own Remko Rinkema is taking with regard to his bankroll after having earned a big score in last month’s Spring Championship of Online Poker on PokerStars. In the $215 buy-in 8-game SCOOP Event #35-M, Remko finished second out of 548 players to earn a $18,195.21 payday — even more than the eventual winner thanks to a heads-up deal. The final table included Jason Mercier (who finished third) and Dzmitry Urbanovich (who took fourth), with 12th-place finisher Ryan D’Angelo among the other top players going deep. As Remko explained on the PokerNews Podcast, that buy-in of $215 wasn’t insignificant for him, which made the $18K-plus score especially big in terms of his online bankroll.